As the leaves turn on Jenny Jump Mountain this Fall, the Historic Moravian Village of Hope will be gearing up to celebrate 250 years since the Moravians first settled the hills along the Beaver Brook. A large group of volunteers formed the 250th anniversary committee to plan a number of special events throughout the year leading up to the big weekend. In addition, flowers and flags are going up on the streetlight poles in the heart of the village to commemorate the anniversary. The year 2019 is actually the 250th anniversary of the year when the first Moravian settler, Peter Warbas, built his log cabin on the corner of Cedar and Walnut Streets in 1769. The house, the earliest example of vernacular Moravian architecture in the village, is now expanded as the home of Harry and Lauren Mount, shown above. According to the history of Hope written by Mio French, a founder of Help Our Preservation Effort (H.O.P.E) and a long-time member of the historical society, prior to the arrival of the Moravian settlers there was no formal settlement of Hope, just some farms on Jenny Jump Mountain south of the present village. The Moravians, whose formal name was “Unitas Fratrum”, or Unity of the Brethren, were followers of John Hus who famously protested against the Roman Catholic Church in 1415. The bulk of his followers worshiped in Moravia and Bohemia in what is now the Czech Republic. Count Nicolas Ludwig von Zinzendorf, a Christian mission pioneer and a major figure in eighteenth-century Protestantism, was a benefactor of the Moravian movement. According to von Zinzendorf’s biography, he sought to create an ecumenical Protestant movement and sent missionaries to the New World. Their first settlement was in Savannah, Ga., but they left after about five years and established their North American center at Bethlehem, Pa., in 1740. After about fifteen years they set out again, to the south, north and east. When Moravian missionaries arrived in the vicinity of Jenny Jump, they enjoyed the hospitality of Samuel Green Jr. and his family, early settlers who had prospered to the extent that the area was then known as Greenland. Green and his wife, Abigail, who had fled to Bethlehem during the French and Indian War, were so enamored with the Moravians there that they joined the faith and eventually offered 1,000 acres of their land on which to build the planned settlement called Hope in 1768. The Warbas family also stayed with the Greens before building their new home. 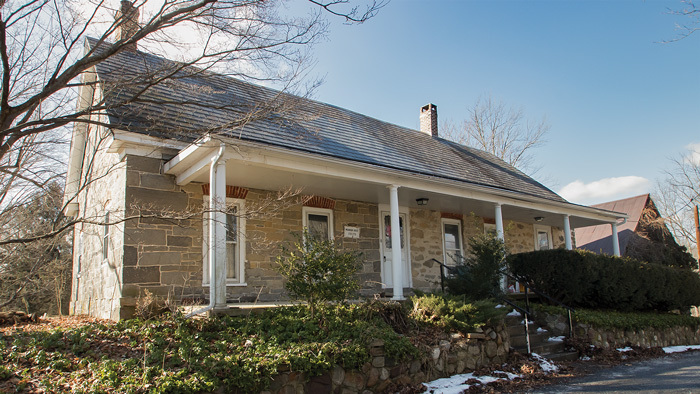 One of the nicest examples of Moravian residences in Hope, “Monica’s House” is named after a long-time resident. 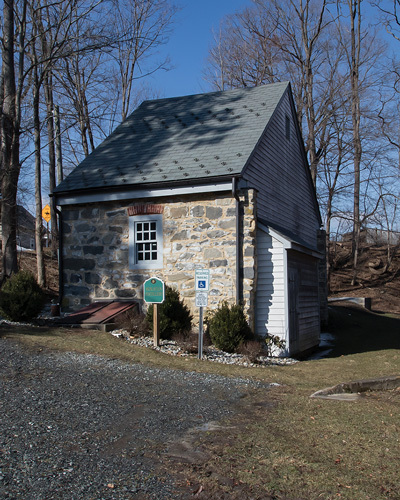 The Moravians left Hope in 1808 to return to the Lehigh Valley because of debt in Europe and competition from a gristmill opened nearby by Joseph Swayze in 1787, according to the old diaries that have been translated from German. They left behind the unique architecture that enchants visitors when they come to Hope, buildings that have been adapted for commercial businesses or contemporary homes. The Moravian houses are easily recognized by the trademark brick lintels over the windows. Some of the buildings are far removed from their original use—the Gemeinhaus, or church, is now the home office of the First Hope Bank. The Single Sisters Academy has become an office building, known locally as The American House. The lodging for Moravian single men, now called The Long House, is home for several businesses. The gristmill has since been converted to the Inn at Millrace Pond, a fine dining and accommodations destination. Hope looks much like it did when the Moravians departed because it was bypassed to the north by the railroad and to the south by the Morris Canal. The village also lost to its neighbor, Belvidere, in a bid to become county seat when Warren split from Sussex County in 1825. Belvidere now has the courthouse and other county buildings as well as the classic center square. Surrounded by farms, Hope retained its tidy Moravian village character. The Township of Hope was incorporated in 1839 after it separated from neighboring Knowlton Township. Two Moravian barns remain. 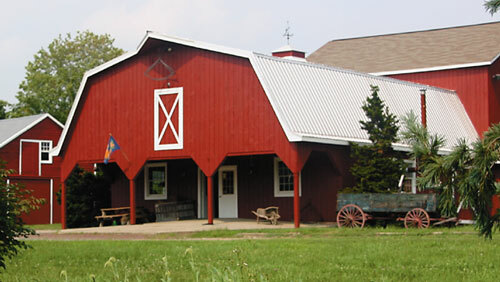 The Billow barn, next to the former Farm Manager’s House on Walnut Street (above) is enlarged and still in use on the only continuously operating Moravian farm in the country. The Nicolaus barn at the corner of Cedar and Hickory streets is not in good repair. 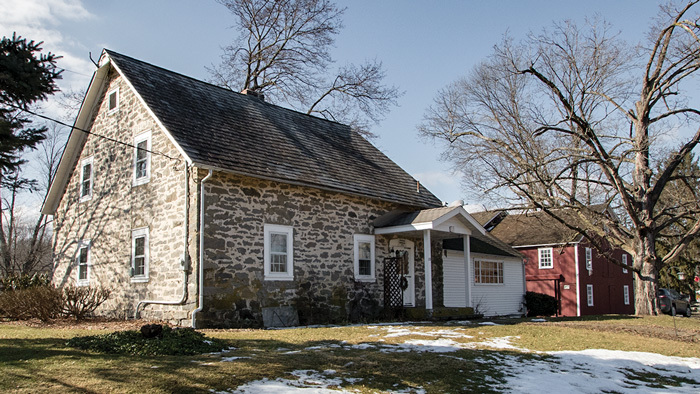 It is adjacent to Stephen Nicolaus House, c.1775-1776 (below) that contains a beehive oven used by Moravians for common baking. The house later became the Methodist parsonage for many years. 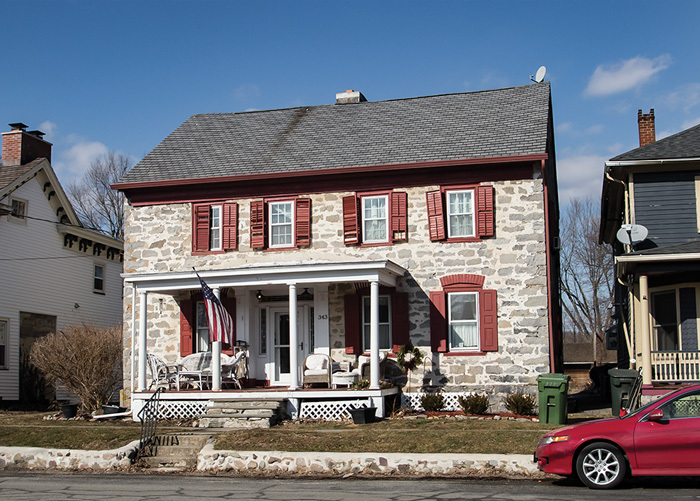 After the Historic Moravian Village of Hope was named to the state and national Registers of Historic Places in 1976, residents thought that a local historic ordinance and Historic District Commission would be the best way to protect the historic structures. They consulted the National Registry for samples from other municipalities around the country before crafting their ordinance. In the early 1980s, architectural historian and Warren County native Dennis Bertland inventoried Hope’s historic district and found a number of deteriorating structures. This was an inspiration for members of the historical society to form H.O.P.E., according to French. The organization commissioned architect David Parker of Southport, CT, an expert in Moravian design, to develop an archive. Later, Mark Hewitt, then an associate professor of architecture at New Jersey Institute of Technology and a resident of the historic district, assigned students to document each historic structure within the district. In 1991, a committee chaired by Hewitt completed a comprehensive Village Master Plan which addressed historical matters, parking, traffic, drinking and wastewater issues and public education about the commission and its priorities. Ms. French pointed out how important it is for people to understand the reasons for historic preservation regulations. Many municipalities with historic preservation districts find that residents feel encumbered by, and object to, regulations on their property. Top: The Moravians were religious, but hardly teetotalers. Their distillery is being restored by the town. During the tours, blacksmith William VanHeteren will demonstrate knife-making here. Bottom: After the Moravians retreated across the river, later settlers built three churches, including St. Luke’s Episcopal Church in 1839. The stone structure is a favorite for visitors to Hope and is often the site of concerts as well as its church services. Most of the buildings were restored privately. The First Hope Bank retains its original exterior appearance while the interior respects the early days of its life as a bank, including old-fashioned wire over the tellers’ stations. When the bank was connected to neighboring buildings the linking structure created minimal disturbance. 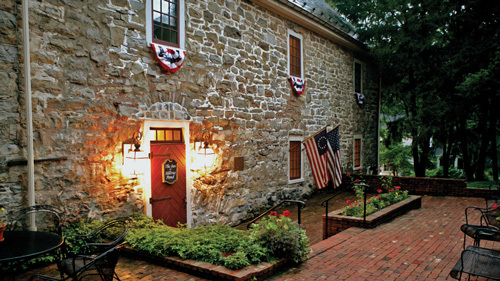 The gristmill, now the Inn, retains the authentic exterior of the original. 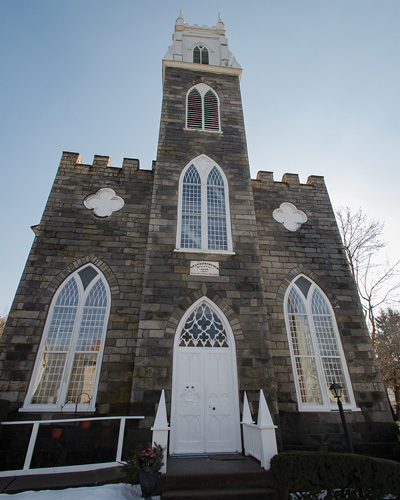 But after the building burned in 1808, the interior was rebuilt by a few of the remaining Moravians. In an interview with a local newspaper in the 1990s, Hewitt said the interior features subtle changes, so patrons can still see the historic nature of the old mill. George Beatty, a former municipal official, spearheaded the township’s contribution to restoration at Hope’s Community Center. The former Christian Church, on the site of the Moravian Log Tavern, is now the site of basketball games, cheerleading practice, yoga classes, parties, and the annual Halloween celebration. An electrical upgrade for the building took first priority in order to prevent the recurrence of a disastrous fire in 1918 fire that burned along High Street. The township also installed a ramp from an adjacent parking lot to the side door of the building. Hope’s annual Christmas Craft Market provides funding for the Community Center upgrades. After the 1918 fire, Warren County constructed Route 521 as the main road north to Blairstown. The county also built the stone arch bridge on Route 519 to facilitate access to the village from the farming areas south and east toward Hackettstown. One of the major changes to the village in modern times was the move of the Bottomley House to a site on the property of the Inn at Millrace Pond. The innkeepers, Charles and Cordie Puttkammer, were allowed to take the house at no cost but said they paid about $75,000 to have it towed 1.6 miles with two flatbed trucks serving as brakes in front of the house as it passed over the steep bridge on its journey. The estimated 3.5 hour trip was halted many times as tree branches were cleared out of the route, and the blinker light in the center of the village spent the afternoon on the sidewalk in front of Hartung’s Store. The school children from Hope School were dismissed from classes to sit on the grassy hill next to the school and watch the house turn into the parking lot of the Inn and settle into place. 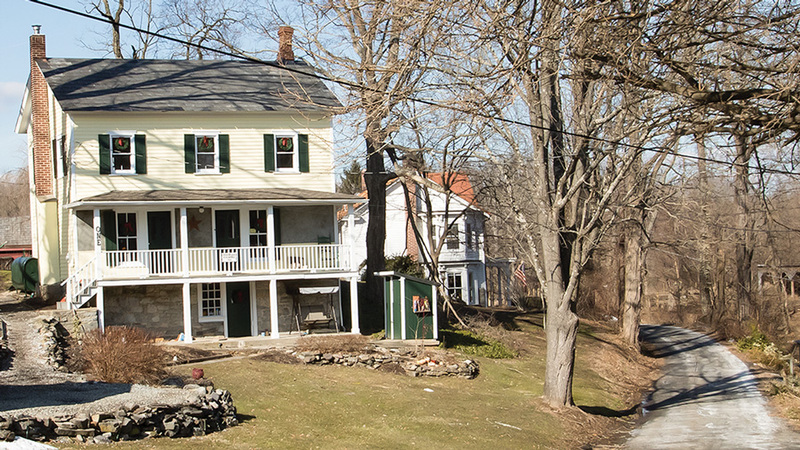 Having prevailed over of physical relocation to the property and the rigors of historic restoration, the Bottemly House now appears, in large part, as it did in 1830. The Puttkammers left a wall open on the interior of the house to illustrate the old construction. The house is currently used to host weddings, meetings, dinners and other events. In 2001, the house was host to a Festival of Trees as a fundraiser for police and fire victims of 9/11. The Festival followed a months-long effort led by Hope School moms to bring lunches to the Duane Street Firehouse, the closest firehouse to Ground Zero in the aftermath of 9/11. “When somebody died, country people bring food,” the project’s founder Dawn Nordstrom explained at the time. Which may do as much as anything to explain exactly what Hope is: a village that clings to both its history and its values. Events will begin on Friday, Sept. 20, with a dinner at the Inn at Millrace Pond and continue throughout the weekend. 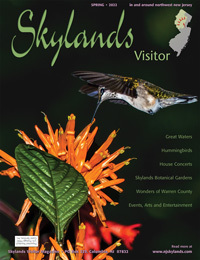 Visitors will get a chance to see the village throughout Saturday, Sept. 21. The first walking tours will begin on Saturday morning after a breakfast for visitors and residents at the Grange on Great Meadows Road. At 1 p.m., the Hope Fire Department will be joined by many local groups for a parade. Grand Marshal will be Mary Billow who, at 96, has been involved in many of the historical projects in Hope for most of her life. The 250th Anniversary committee has contracted with a Town Crier to read the original proclamations of the Moravian Village. Local businesses and charitable organizations are being encouraged to create floats to join in the fun. The parade ends at the recreation fields near the township school with opening remarks by Township Mayor Timothy McDonough, who is in his 31st year leading the township, and Bryon Grigsby, president of Moravian College in Bethlehem, Pa. Vendors with a connection to Hope or with local farming or history-specific items will set up around the fields. Old fashioned games for children, such as hoop rolling and ring toss, will be available and there will be a food vendor at the field house. The United Methodist Women at St. John’s Church on High Street will serve tea by reservation only. Antique quilts will be displayed over the pews in the St. John’s sanctuary. The Hope Historical Society Museum will also be open for demonstrations. Walking tours will continue from 3 - 7 p.m., and old videos of Hope will be shown at the Community Center around 6 p.m..
On Sunday a trombone choir will announce the church services to be held in the morning. Also planned is a wreath laying at the grave of Samuel Green. Later in the day townspeople and visitors will be invited to an expanded version of the town picnic that is held annually each fall at Swayze Mill Park. Because it will be held later in the day than usual, the committee plans to float luminaries on the lake. Other events are still being discussed by the committee, including a scavenger hunt similar to one that was held on the 20th anniversary of the founding of H.O.P.E. Out of the Box: Gift Shopping on Main Street!